The Foxes were reeling at the interval when 2-0 down having seen Jamie Vardy contentiously dismissed, a debatable penalty awarded against Danny Simpson and five of their players booked by referee Craig Pawson. 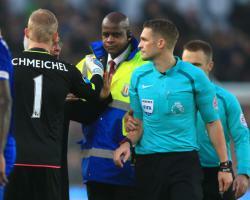 Their perceived sense of injustice even extended to the usually unflappable Claudio Ranieri, who needed to be dragged away from Pawson by Schmeichel after expressing his frustration on the pitch at half-time. Having calmed his boss, goalkeeper Schmeichel, back again after missing eight games with a fractured hand, then rallied his team-mates at the break before the 10-man Foxes claimed an unlikely point thanks to second-half goals from Leonardo Ulloa and Amartey. "We had to come back and fight together." Though they may have left the bet365 Stadium with just their second point on their travels, it came at a cost. Vardy's dismissal has triggered a three-match suspension, which could yet be overturned should the Foxes elect to challenge it - as Ranieri hinted they might, but Christian Fuchs and Robert Huth picked up their fifth cautions and will be banned against Everton on Boxing Day. The duo were two of six players booked, a figure that ensures the champions will incur a fine, and they may also face action from the Football Association if it is proved the officiating team were hit by missiles thrown from the away supporters as the officials entered the tunnel, with the stewards who led them down there pictured shielding themselves. At that point, a Leicester fightback looked unlikely, but Ranieri's decision to bring on both Ulloa and Demarai Gray provided the visitors with a spark. "It's a good asset for us," Amartey said of Leicester's squad strength. I'm very happy for Demarai and those that came in to change the game and help us." Gray and Ulloa are two options Ranieri may consider if Vardy is forced to sit out the fixtures with Everton, West Ham and Middlesbrough. Stoke boss Mark Hughes and Ranieri differed in their view on the dismissal, with the former adamant the England striker had lunged with two feet and the Foxes boss noting he had been pushed off balance by Glen Johnson before tackling Mame Diouf. It was another Pawson decision that provoked debate, three days on from his call to only book Manchester United's Marcos Rojo for a two-footed challenge on Wilfried Zaha, and ex-referee Howard Webb has already suggested he should be stood down from the New Year's Eve fixture between Liverpool and Manchester City. And though Hughes could see Pawson's reasoning, Potters striker Jonathan Walters conceded his team were fortunate to benefit from it. "I think we got a little luck with the red," he told BBC Radio Stoke. I think Glen pulled him back a little bit."